To many people, Mexican urban legends consist of old western tales of cowboys and gunfights, while for other folks the legends consist of weird stories about mutated animals. Read on to learn more about the truth behind many of these urban legends. The following stories are examples of the most common urban legends associated with Mexico. You may have heard one or more of these stories before, possibly from one of your friends who thought it was true. Try to figure out the underlying "message" of each story. This scary urban legend starts out with a husband and wife traveling to Mexico on vacation. Mexico is notorious for its high population of stray dogs. Within the many variations of this story, the wife eventually spots one of the dogs either outside her hotel room or on the street while shopping. She falls in love with the dog and eventually decides to wrap up the poor stray and take it home. Here is where the stories differ slightly depending on the version. In some versions, upon returning home, the woman returns from work to find that the dog has eaten her cat. In other versions, the dog is sick and foaming at the mouth. Whatever the reason, she takes the small dog to the vet, where she's told by a shocked veterinary staff that the strange creature she has brought home with her from Mexico is not a dog at all; it's actually a very large sewer rat. The Eagles released the song The Hotel California in the 1980s. 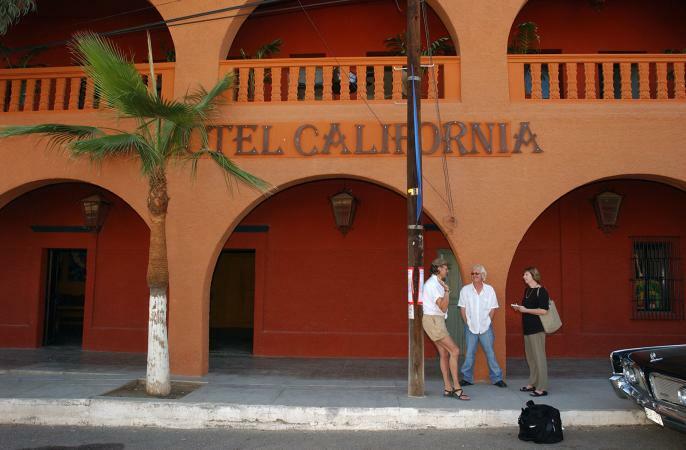 In the 1990s a rumor was circulated by certain newspaper journalists stating that the Todos Santos, in Mexico, was the famed hotel mentioned in the song. Through the years, other journalists quoted the original stories until the legend soon became an accepted part of modern culture - a true urban legend. The hotel even promoted itself through the years as the famous hotel by selling souvenir shirts and other memorabilia to visiting tourists. Finally, in 1997, a travel writer by the name of Joe Cummings wrote an investigative piece in the March 2000 issue of the Mexican magazine El Calendario de Todos Santos on the matter. According to his report, he wrote to songwriter Don Henley and asked him about the urban legend. Don Henley responded with a faxed letter that completely dispelled the old legend as nothing more than a false rumor. Why the original newspaper reporters never bothered asking Don Henley themselves remains a mystery. In 1854, a California journalist from San Francisco wrote a sensationalized story about a man named Joaquin Murieta. In his dramatic account, Joaquin was a Mexican whose wife and brother's murders drove him to a life of violent vengeance against "all Americans", until he was ultimately captured and killed by the famous California Rangers of Captain Harry Love. This story was not only supported by the retelling of local folklore throughout California regarding the terror this alleged bandit caused, but it was also supported by a decapitated and preserved head that supposedly belonged to Murieta. This preserved head was displayed throughout the California sideshows of the late 1800s. The head itself was never positively identified. Unfortunately, the only evidence that historians have ever found that supports this tale is the fact that the California State legislature passed a "Five Joaquins" act in 1853, cautioning rangers that there were many citizens who had the same name. Eventually, the California governor did pay Captain Love a bounty of $1,000.00 and an additional $5,000.00 from the legislature. However, historians believe the high amount of the award signifies that more than one man was captured by Captain Love, and that the legend of a single violent bandit man named Joaquin Murieta is nothing more than urban legend. Where Do Urban Legends Come From? In a Psychology Today article titled What Fuels Urban Legends, author Darcy Lockman notes a study conducted by psychologists at Stanford and Duke universities that showed that urban legends come from a base fear shared by a group of people. Often, those fears are related to stereotypes, and other times they are just basic psychological fears. During the course of the study, an urban legend was distributed to undergrads. The penetration of that story was then traced throughout the University. What the psychologists found was that undergrads "consistently repeated" the version of the urban legend that was the most disturbing. Whether you believe these Mexican urban legends, it is fascinating to consider how most are created and how they propagate throughout society as truth, regardless of whether or not evidence supports them. It's interesting to note that most of these stories begin with a small element of truth and are then surrounded with dubious details. Maybe that is the secret recipe that makes urban legends such a prevalent part of modern culture.